The name is derived from the Latin 'Rosmarinus' or 'sea dew', as it is rather fond of water. The Egyptians, Hebrews, Greeks and Romans considered the herb as sacred and even in the Middle Ages it was used to ward off evils spirits and used as a protection against the plague. It was burnt in French hospitals during epidemics. it is a shrubby evergreen bush that grows up to 1.5 meters (4 feet) high with green-gray needle-shaped leaves and pale blue/lilac flowers that bees just love and is originally from Asia, but is now cultivated in France, Tunisia and Yugoslavia. Rosemary oil has a clear, powerful refreshing herbal smell, is clear in color and watery in viscosity. Rosemary oil is extracted from Rosmarinus officinalis (also known as Rosmarinus coronarium) of the Labiatae family and is also known as incensier. Rosemary oil is extracted from the fresh flowering tops by steam distillation. It yields 1.0 - 2.0 %. 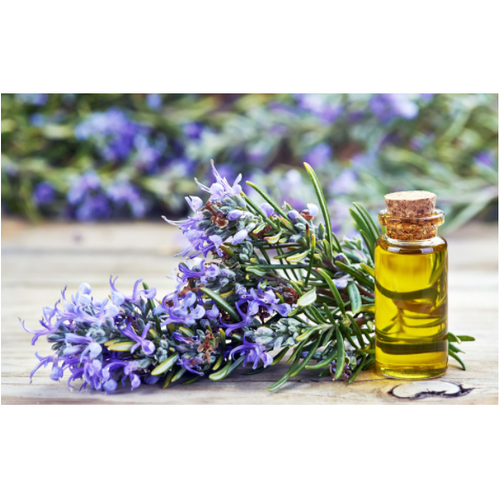 Rosemary essential oils blend well together, Rosemary oil blends particularly well with Cedarwood, Citronella, Geranium, Lavender, Lemongrass and Peppermint. Rosemary oil are analgesic, antidepressant, astringent, carminative, cephalic, cholagogue, cordial, digestive, diuretic, emmenagogue, hepatic, hypertensive, nervine, rubefacient, stimulant, sudorific and tonic. It also helps for arteriosclerosis, palpitations, poor circulation and varicose veins. Yield 1.0 - 2.0 %.